Hundreds of hometown LeBron James fans made an appeal to keep him in a Cleveland uniform with a single word: Home. 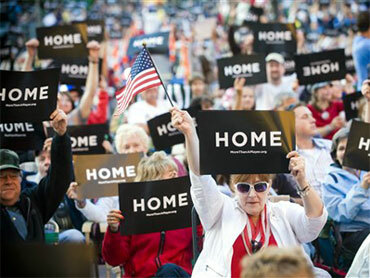 The word "Home" was held aloft on cue Thursday night on some of the 20,000 posters that were expected to be distributed to people attending Cleveland's annual July 4th weekend concert by the Cleveland Orchestra and fireworks display. The word "home" was also spelled out vertically in the lights of a nearby building. "A lot more than he realizes - the hotels, bars and restaurants will suffer," Anthony Petrello, a 23-year-old fan of James from Middleburg Heights, said a couple hours before the display of affection downtown. "The Cavaliers will suffer." The addition of "Home" to James' themes, which he has used repeatedly - Team, Commitment, Family, Community and Mission - invoked his ties to Cleveland and his nearby hometown of Akron. The appeal, which included a video montage of people encouraging James to stay, was arranged by the orchestra and the Fans for LeBron Committee and its website MoreThanAPlayer.org. The hometown pitch came at the close of a whirlwind day as James became a free agent and began meetings with prospective teams, the New Jersey Nets and New York Knicks. James is scheduled to hear what the Miami Heat and Los Angeles Clippers have to offer him to leave, but Kevin Krumphanzl hopes he ends up staying after talking with the Cavs. "He gives the city hope," said the 29-year-old fan from Lakewood. "Cleveland's just a tragic sports city." The Browns, Indians and Cavs have contributed toward a misery-filled history for the city's teams since the Browns won the city's last championship in 1964.